What it is: A box of deluxe samples that are curated by the Birchbox team or hand-picked by you to basically ensure you never again have beauty buyer's remorse! Beauty bonus: For our first box, we loved the variety of products. We also appreciated the range of price points on the offerings, which ensures that if we loved it once the sample is done, odds are we can afford to buy the full-sized version. Beauty bummer: The fragrance sample didn't totally fit our scent profile — while we loved the floral and vanilla fragrance, we prefer something a little more earthy for the winter months. Overall: We are excited to be test-driving Birchbox beauty deliveries for a few months. The idea of receiving new goodies each month is one we can ascribe — or subscribe to, so we're looking forward to seeing what exactly comes in the mail. The highlights in this month's box were the LOC lip pencil and the Sunday Riley facial treatment. The intense lip colour was uber smooth to apply, feeling very balm-like and leaving lips hydrated without the drying effect of some matte lipsticks. And the facial treatment was scented with zingy citrus, leaving skin feeling refreshed and smooth. After all, who doesn't love getting a pretty package filled with beauty products in the mail every month? We especially love the fact that full-sized products are available for purchase online. So if you loved the mini size, you can easily upgrade to the big version without any hassle. Price: A subscription is $14.95 per month ($10 + $4.95 shipping and handling) or $100 per year. 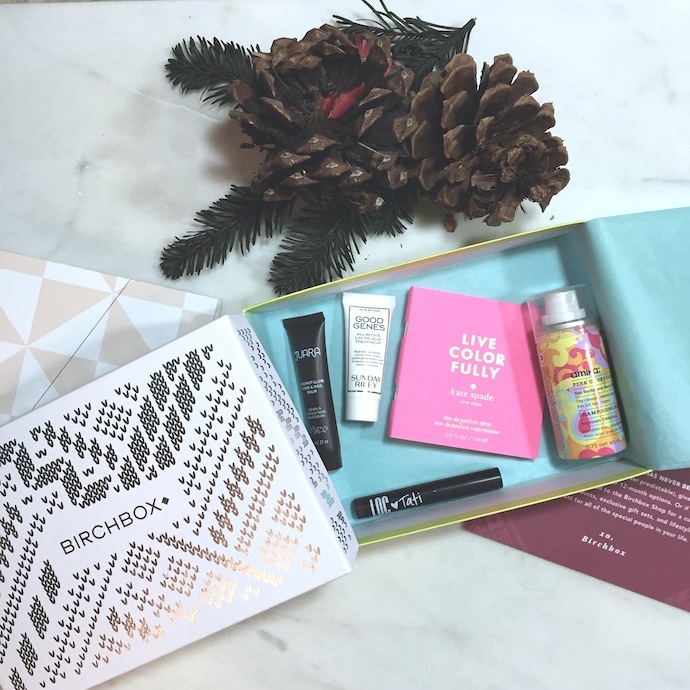 The price of the full-sized products featured in our December Birchbox include Amika Perk Up dry shampoo, $26.50; Juara Coconut Illipe hand and nail balm, $26; Kate Spade Live Colorfully, $90-$115; LOC Vibrant matte lipstick in Glam Life, $10; Sunday Riley Good Genes Treatment, $110.